After a hearty breakfast at Denny’s in Beatty, we are on our way to the nearby Bullfrog Hills and the old ghost town of Rhyolite. As we travel up what was once the main street of the town, it is difficult to imagine that it was once a thriving community. Only a few crumbling structures remain. It is like finding scattered bones in an archeological site. The land upon which the town once stood on the edge of Death Valley is arid, sun-drenched with a few hardy shrubs. The cloudless sky is intense desert blue. 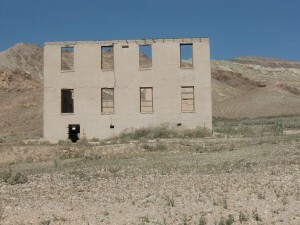 Rhyolite began as a mining camp in 1905 then grew into a flourishing town as more people arrived to work in the gold mines or serve those that did. By 1908 close to 5,000 people lived in the town. They had electric lights, piped water, telephones, newspapers, a hospital, school and even an opera house. A railroad served the town, affording them good transportation.. By 1920, when the gold was all mined out, the population, which had gradually dwindled, dropped to zero. Much of the town was dismantled, the materials taken away to be used in other towns. Only parts of the hardiest structures remained. Our bus rolls up the slope of the old main street to its crest where the well-preserved railroad station remains. 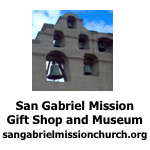 It was built in what might be called a mission style. Healthy Joshua trees, twisted into strange shapes, are the station’s only “landscaping.” The tracks are long gone. Even the roadbed isn’t detectable. I stand on the old waiting platform and try to imagine a smoky steam locomotive coming around the bend, approaching the station. After exploring the railroad station, we walk down the gradual slope to the remains of the Cook Bank Building. Only the front façade and a small amount of the crumbling sides and rear remain. But the building’s skeleton is still impressive as it reaches three stories into the pastel blue of the sky. Again I have to imagine people moving in and out of its doors after having deposited money or taken out a loan. The bank building was once imposing with its Italian marble stairs and its stained glass windows. Next, back from the road, stands what is left of the two-story schoolhouse. The pale white roofless structure looks like a ghost. Spaces for windows are large empty squares on the still-erect walls. I find myself wondering how, without air conditioning, the rooms stayed cool enough for the kids to survive in the hot weather. I can imagine kids yelling and shouting to each other on the playgrounds. That envisioning makes the silence that surrounds the old walls now, even more silent. I wonder too, whether any of those students ever wrote about their experiences in the old school. Most curious of all the remains is the bottle house, its walls made completely of bottles on their sides, held in place with concrete. I imagine that it still exists only because people looking for building material could find no use for it. I peek in through one window to a room eerily lighted by sunlight passing through all the bottles. 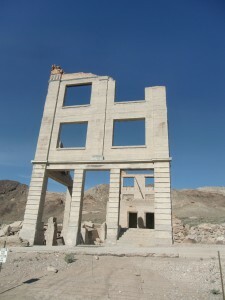 Whoever lived in it constructed in his yard, with stones and minerals, a miniaturized version the town of Rhyolite as it was in its heyday. Really remarkable. For reasons I don’t understand, the Belgian artist, Albert Szukalski, sculpted his version of “The Last Supper” near the entrance of the old town. This was done in 1984 and still exists in good shape, all in brilliant white. It has nothing to do with the rest of the ghost town. In my opinion it’s an intrusion into the feel of the place. We had seen some of the highlights of Death Valley in the few days of the trip, but there is much more to see. Now it’s time to begin the long trip back to Monterey Park, leaving all of that desolate but fascinating land behind us. Wandering around Rhyolite is much like strolling through a graveyard, the remains of the old buildings like large tombstones in a desert cemetery. The visitor must get beyond just what he sees and use his imagination to make it live again. 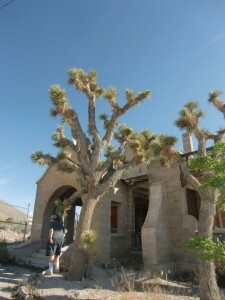 Joshua Trees are the only landscaping of the old railway station. The facade of the old bank building reaches into the desert sky. It's difficult to imagine students in this old school house learning much in the desert heat. 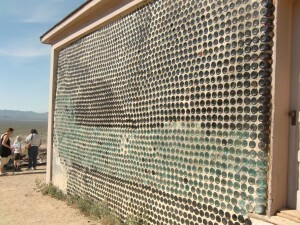 Most unusual is this house made of bottles held in place by cement.